By capitalizing on her experiences, she has transformed her passion of sustainable development into expertise in “Communication responsible” accompanied with a training given by ADEME (Agency of the Environment and harnessing of energy in eco-communication). Her knowledge of human, industrial and technical environment of the enterprise allows her to develop a global approach and comprehend then each of the missions with all the required meticulousness and expertise. 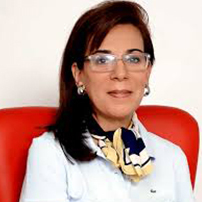 Sabr Abou-Ibrahimi was responsable about the gender’s strategy of the Corporate Social Responsability commission, in CGEM (Moroccan Companies General Confederation) and she leads a project Wad3yati (which means in arabic, “my situation”). It’s focused on advancing gender equality in the Moroccan workplace financed by the United states Department of a labor (USDOL). Very implicated in the gender approach, she was formed to the leadership management and the women leadership/ empowerment. Authors of many articles about the leadership in general and specially about the women leadership, she made in 2015, a study about Moroccan women who started with nothing and have succeeded. This research brought sabr to set up a model, in French P.E.P.S (Perseverance/ Engagement, Commitment/Patience/ Soi, Self). Today, she organizes workshops to share this model, to give to women the keys to realizing their dream and succeeding in their life!